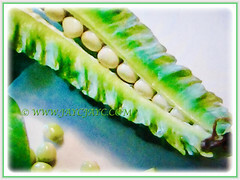 Four-angled Bean or Winged Bean is a tropical legume plant. Popularly grown as it is nutrient-rich and almost all parts of the plant are edible. It has exceptional nitrogen-fixing properties that is used as a green manure for soil improvement and restoration. Botanical Name: Psophocarpus tetragonolobus (syn. : Ananas acostae, Ananas argentata, Ananas bracteatus, Bromelia ananas). 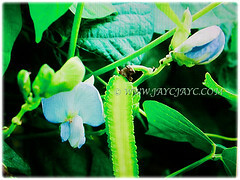 Common Names: Four-angled Bean, Winged Bean/Pea, Princess/Asparagus Pea, Manila/Goa Bean, Kacang Botol in Malay. Etymology: The genus name Psophocarpus means noisy fruit as some plants in this genus have pods that make a popping noise when they release their seeds. The tetra part of the species epithet tetragonolobus means four, referring to the four sides of the fruit. Origin: Native to New Guinea. Plant type: An ornamental fruit-bearing vine. Features: Psophocarpus tetragonolobus is from the genus Psophocarpus that consists of 6 species of flowering plants. Winged Bean is a herbaceous perennial with tuberous roots but can be grown as an annual. 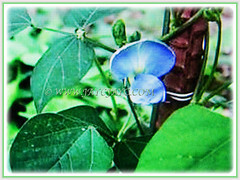 A fast-growing, high-climbing and twining vine that can reach 3-4 m in height around a support. 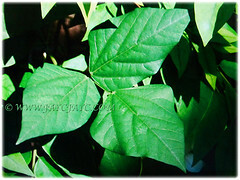 Its green leaves are trifoliate on 12 cm long petioles, each consisting of 3 leaflets. 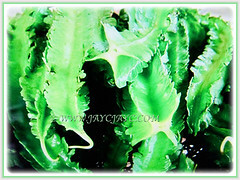 Leaflets are large, 8-15 cm long and almost as wide at the broadest point, with ovate lateral leaflets or deltoid terminal leaflets. 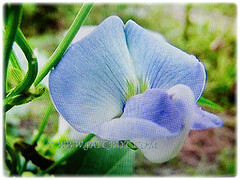 It produces 2.5-3.5 cm wide pea-like bisexual flowers, papilionaceous and are usually coloured light blue but occasionally white. Eventually the showy flowers will develop into fruits that are elongated pods, measuring 15-30 cm long and 3 cm wide. They are square in cross-section with the four corners tapering out into the thin wings. Frilly or sometimes smooth wings protrude along the length of the pod at each corner. They are green, yellow-green or green with purplish-red wings and turn brown when fully ripe with a waxy skin and white coloured flesh. At maturity, the pods turn brown and break open with a loud popping noise to release approximately 5-21 round and smooth seeds. Seeds are sub-globose about 0.5-1 cm across, white, yellow, brown or black, or mottled with a small aril and non-endospermous. Culture (Care): Psophocarpus tetragonolobus or Goa Bean can be grown easily with least maintenance. Moisture: Moderate water requirements. It can tolerate short periods of drought but regular watering ensures best production. Besides, it loves a humid environment with plenty of rainfall. Soil: Humus-enriched and well-drained soils. However, it does tolerate various types of soils. It hates wet feet, thus good drainage is crucial. Others: This leguminous plant literally makes its own fertiliser with the help of a soil micro-organism known as Rhizobium species. If needed, once every fortnightly, fertilise the vine with manure to stimulate growth and fruit production. Provide a trellis or pole to allow the vine to climb to maximise production of fruits. Begin harvesting the fruits about 10-12 weeks after planting. If you desire to consume the tubers, pinch off the flowers to promote tuber development. Generally free from serious pests and diseases. However, it is susceptible to false rust, dark leaf-spot, root knot nematodes and various insects pests. Watch out for caterpillars as this beauty is a caterpillar food plant. Psophocarpus tetragonolobus or Winged Bean is a herbaceous perennial but can be grown as an annual. It is frost tender but will return from its large tuberous roots if the top is killed by the freezing temperature. Ideal growing temp is 25°C as lower temp suppress germination and extremely high temperatures inhibit yield. To flower, it requires daylight length of less than 12 hours. It needs at least 180 frost-free days from planting seed to harvesting mature pods. Nevertheless, flowers and immature pods can be harvested in as little as 60 days. 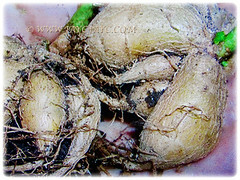 Removing the flowers will increase the tuber harvest. Propagation: Easily propagated from seeds. Soak seeds or nick their surface for one to two days to speed germination. Usage: Grow Psophocarpus tetragonolobus or Four-angled Bean in your veggie garden to ensure pesticide-free fruits for your family all year round. It has exceptional nitrogen-fixing properties that’s used as a green manure for soil improvement and restoration. Almost all parts of the plant are palatable including fruits, leaves, flowers, seeds and roots. 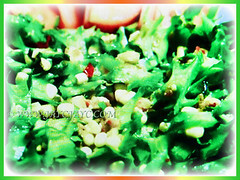 Leaves can be eaten like spinach, flowers can be used in salads and tubers can be eaten raw or cooked as potatoes. 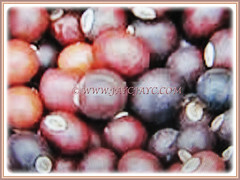 The half-ripe seeds can be removed from the pod, and then roasted and eaten like peanuts or fermented and used as tempeh. The light blue flowers are also used to colour food products such as rice and pastries. Seeds can be used to make flour, edible oil, milk and tofu, as well as a coffee substitute with the roasted seeds. Besides, its stems and leaves are nutritious food for livestock forage. 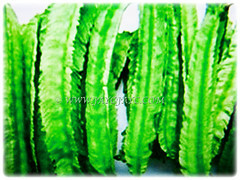 In Malaysia, the Winged Bean are used as an effective remedy for smallpox and as a cure for vertigo. It is suited for container gardening or grown in the ground.